← Kicking off our 5th Annual Countdown to Halloween with a New Banner! 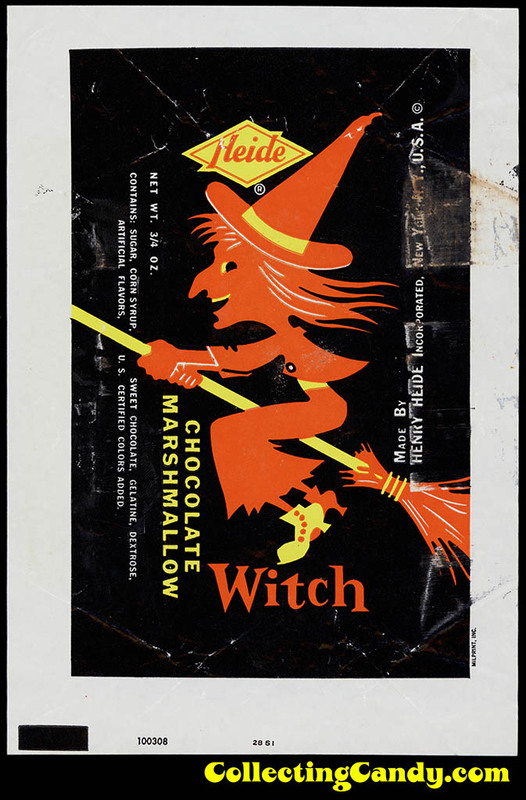 A Fantastic Vintage Halloween Heide Witch Wrapper! Back in 2013, I kicked off our Countdown to Halloween with what was, at the time, my favorite vintage Halloween wrapper; one for a Brach’s Chocolate Covered Witch. Today, that Brach’s Witch wrapper is getting some serious competition as I present an outstanding piece of previously unseen Halloween confectionery packaging from Heide – make the jump to check it out in all its spooky-fun glory! I’ve estimated the vintage of this wrapper to be from the 1950’s-1960’s era and while I’m confident that range is accurate, I cannot absolutely corroborate it, so it’s possible that it dates back even further. Both of those wrappers are stunning Halloween classics and a testament to just how cool this vintage confectionery material can be. To my eye, they are stellar examples of packaging from the past that transcend to become pop art. For those that don’t already know, Heide was a major candy manufacturer throughout most of the 20th century, and while the company itself has not survived, the Heide brand name, as well as a couple of their most popular products, remain on store shelves – both distributed these days by the Ferrara Candy Company: Jujyfruits and Jujubes. Heide Jujyfruits from the 1970’s and today. Heide Jujubes from the 1970’s and today. So while today’s Chocolate Covered Witch wrapper stands a gorgeous relic from our confectionery past, the Heide name lives on to delight consumers in 2016 and beyond. And that’s everything I’ve got on this fantastic Heide’s Halloween Witch wrapper. See you next time! This entry was posted in 1950's, 1960's, Chocolate, CountdownToHalloween, Halloween, Holiday and tagged candy collecting, candy collection, candy collector, candy wrapper collection, candy wrapper collector, collectible, collecting candy, confectionery, confections, Halloween, Heide, mid-century, packaging, packaging design, sweets, vintage, vintage candy wrappers, witch, wrapper. Bookmark the permalink.